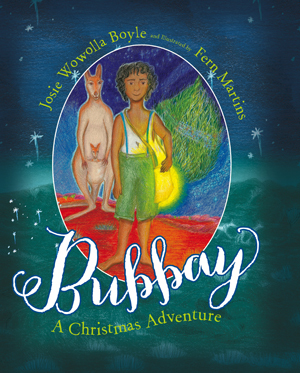 Full of magic, wonder and friendship, Bubbay is a gorgeous story from Josie Wowolla Boyle, a Wonghi woman from Western Australia. Bubbay lives quite happily in the Australian outback. He gazes at the stars before falling asleep, and tends his goat herd carefully to ensure they provide him with lots of lovely milk. Down on the plain lives Mrs Timms, a ‘lonely lady’, who lives in a ‘simple house’ and gratefully accepts Bubbay’s goats’ milk in exchange for fresh eggs. On Christmas Eve Bubbay can’t help but feel lonely, and wishes for a special Christmas with a tree, a home and some family. Here is where the magic shoots into the story as a special Christmas tree magically arrives. With a challenge to be completed by Bubbay before sunrise, help arrives in the shape of ‘old grandma Gubarlee’ who guides Bubbay gently through his search for five special items. Fern Martins’ reputations as an artist is well established. In Bubbay her illustrations bring the magic of the narrative alive with a wonderful palette that encapsulates the heat, and magnificence, of the outback. Her colours and vibrancy capture ‘a shimmering glow with a fiery tale flashed cross the sky’ beautifully – a stand out page for My Book Corner! Boyle’s narrative encompasses a little bit of adventure, a sprinkling of spirit and a generous dose of friendship, all converging to create a wonderful bundle of enchantment and Christmas cheer – Australian style. Wonderful. With 44 pages Bubbay is perfect for reading aloud to slightly older children, and would be a great one for those who are beginning to read their own chapter books.